Wolf's Construction is here for those unforeseen events that create a disaster to your home. We specialize in home restoration. Whether it's fire, wind, rain, hail, floods, storms, broken pipes or anything else that can happen we take care of it all. We secure your home or property all while preserving unaffected areas and minimizing additional damage created by the disaster. We will have you back in your home as quickly as possible. Wolf's will also take care of your insurance claims and adjusting so you can rest east knowing its all done. If it's flood damage from a natural disaster, we also offer house lifting to prevent further damage to your home. Wolf's Construction will not only clean up the damage but will get you back in your home. We will handle your insurance claims and adjusting along with your home restoration project. Our knowledge and experience has helped us to secure all or most of the insurance money for our restoration homeowners. 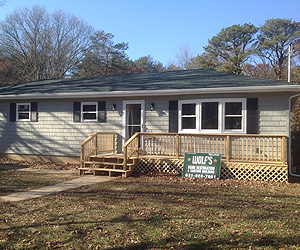 Call Wolf's Construction at 631-988-7661 to get your Free Home Restoration and Home Recovery Estimate. 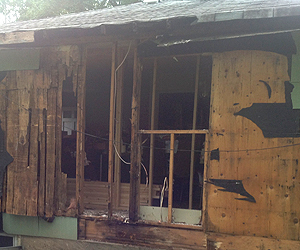 This elderly homeowner had excessive major water damage in the walls and roof of her home. 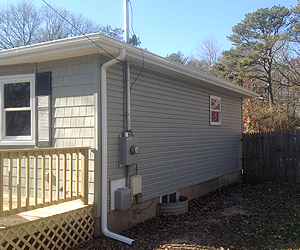 Much of the existing wood had to be replaced before the windows could be replaced or the siding could be installed. The outer wall had extensive damage. A reinforcement wall had to be installed to rebuild the outer wall. A deck was built and added on for curb appeal. Wall needed support to rebuild outer wall. Outer Wall after water damage repairs.